St James' was previously the Church of St Mary's Nunnery, founded in 1100. After the dissolution of religious houses in 1539, it became the parish church of Clerkenwell Green. 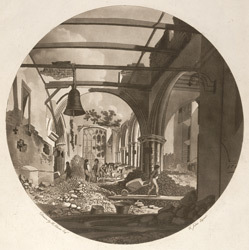 The print shows the demolition in process of the old medieval church in 1789. It was replaced by a typically plain Georgian church, designed by local architect James Carr.